Look at how to say I'm American or I'm Canadian, below. How do you say I'm Dominican or I'm Mexican? How do you say I'm Chinese or I'm Indian? How do you say I'm Irish or I'm Portuguese? Nationalities aren't capitalized in Spanish. Womens' nationalities can end in -a, -e, and -í. The verb ser was the only verb used in the whole conversation. México sounds like Meh-hee-coh. The x sounds like an English h. But in most words, the x sounds like ks. Listen to the students say where they're from. Juliana: Hola, soy Juliana. 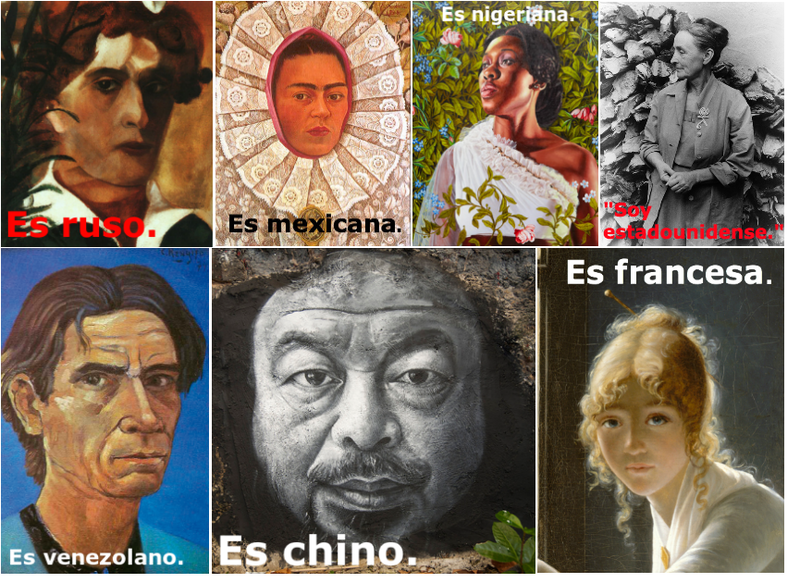 Soy de México. Soy mexicana. Carmen: Hola, soy Carmen. Soy de Chile. Soy chilena. Juan: Hola, soy Juan. Soy de Argentina. Soy argentino. Juliana: Hi, I'm Juliana. I'm from México. I'm Mexican. Carmen: Hi, I'm Carmen. I'm from Chile. I'm Chilean. Juan: Hi, I'm Juan. I'm from Argentina. I'm Argentinian. Juliana: Hola, soy Juliana. Soy de Panamá. Soy panameña. Carmen: Hola, soy Carmen. Soy de El Salvador. Soy salvadoreña. Juan: Hola, soy Juan. Soy de Honduras. Soy hondureño. Juliana: Hi, I'm Juliana. I'm from Panama. I'm Panamanian. Carmen: Hi, I'm Carmen. I'm from El Salvador. I'm Salvadorean. Juan: Hi, I'm Juan. I'm from Honduras. I'm Honduran. Juliana: Hola, soy Juliana. Soy de Inglaterra. Soy inglesa. Carmen: Hola, soy Carmen. Soy de Líbano. Soy libanesa. Jan: Hola, soy Arturo. Soy de Nuevo Zelandia. Soy neozelandés. Juliana: Hi, I'm Juliana. I'm from England. I'm English. Carmen: Hi, I'm Carmen. I'm from Lebanon. I'm Lebanese. Han: Hi, I'm Arturo. I'm from New Zealand. I'm New Zealander. Arturo is neozelandés, whereas Juliana is inglesa. For the feminine form, drop the accent and add an -a. If all the kids were Portuguese, they'd be portugueses. If only the two girls are Portuguese, they'd be portuguesas. To make the plural, you drop the accent and add either -es or -as, depending on their gender. Juliana: Hola, soy Juliana. Soy de Canadá. Soy canadiense. Carmen: Hola, soy Carmen. Soy de los Estados Unidos. Soy estadounidense. Juan: Hola, soy Juan. Soy de Costa Rica. Soy costarricense. Juliana: Hi, I'm Juliana. I'm from Canada. I'm Canadian. Carmen: Hi, I'm Carmen. I'm from the United States. I'm American. Juan: Hi, I'm Juan. I'm from Costa Rica. I'm Costa Rican. All of the nationality adjectives above end in -ense. Remember that any adjective that ends in e can be used for both men and women. If both girls or all three of them were Canadian, they'd call themselves canadienses. Why estadounidense and not americano? Everyone from North, South or Central America is americano. So to say that you're from the US, use estadounidense. Some Spanish speakers will call an American an americano. But I suggest you don't. It's Spanglish. The abbreviation for the United States - US - is EEUU. Juliana: Hola, soy Elsa. Soy de Suecia. Soy sueca. Carmen: Hola, soy Carmen. Soy de Guatemala. Soy guatemalteca. Juan: Hola, soy Juan. Soy de Guatemala también. Carmen y yo somos guatemaltecos. Juliana: Hi, I'm Elsa. I'm from Sweden. I'm Swedish. Carmen: Hi, I'm Carmen. I'm from Guatemala. I'm Guatemalan. Juan: Hi, I'm Juan. I'm from Guatemala, too. Carmen and I are Guatemalan. Someone from Belgium is belga, whether male or female. Someone from Vietnam is vietnamita. For nationalities that end in consonants, add an a for the feminine form. Uruguayans and Paraguayans get a spelling that makes sense, according to the rules mentioned earlier. Just as in English, the nationality and the name of the language are sometimes the same word. 2. Is there just one person, or more than one person?